China in Africa: The Real Story: DRC Debates: Is China's Sicomines Project Good or Bad for the Congo? DRC Debates: Is China's Sicomines Project Good or Bad for the Congo? Chinese managers supervise a Congolese worker in the DRC. On May 27, 2011 I attended a very interesting day-long "debate" in Brussels focused solely on the famous China-Congo "deal of the century" . This package deal was originally a $9 billion package combining a copper mining investment ($3+ billion) and two $3 billion commodity-backed infrastructure credits. (The second credit was deleted under pressure from the IMF). A Financial Times editor wrote about this deal: "Beijing has thrown down its most direct challenge yet to the West's architecture for aiding African development." For quick background and fascinating insights, see the trio of excellent articles by Peter Lee at Asia Times: June 12, 2009; March 11, 2010; and June 11, 2011. The Brussels conference was organized as a "day of study" by an impressive group of young men affiliated with the two biggest Belgian trade unions, 11.11.11 (the consortium of Flemish NGOs), the movement intal (International Action for Liberation), and two Belgian think tanks. They were all well-informed, and their commitment to understanding this deal, their determination, great connections, and a bit of luck enabled them to put together a group of panelists that included the reclusive Paul Fortin, the Canadian lawyer who negotiated the deal for the DRC's state-owned firm Gecamines, Stefaan Marysse, a Belgian professor who is critical of the deal, Yenga Mabolia (coordinator of the World Bank-DFID supported project Promines, Ministry of Mines, DRC), Philip Linza Lukeke (Union Nationale des Travailleurs du Congo, UNTC) and Jean de Dieu Ilunga (Confédération Syndicale Congo, CSC). 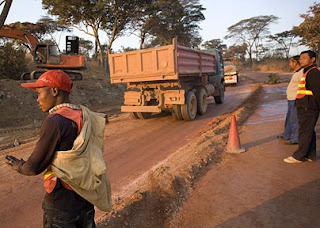 Yenga Mabolia told us that the DRC (nudged by DFID/World Bank) has decided to publish all of its mining contracts (thank you, donors: one win for transparency).If this happens, we should be able to finally compare the Chinese deals to others in the same sectors. Philip Linza Lukeke, a local trade unionist, said that the Chinese infrastructure work "is being done and appreciated by everyone. The country is on its way to being rebuilt. Employment is being generated. Before it used to take 10 days to get from Lubumbashi to Kasinga, now it takes 3 hours*. Market prices have gone down." He concluded: "There are other investments in mining ... but their impact [on our development] is hardly felt. Why is the Chinese contract being attacked?" On the other hand, he mentioned his concern with illegal informal sector workers/miners doing mining and not operating at an international standard. Chinese are involved, mainly as middlemen. He concluded by saying: "The term 'win-win situation' is one that we like very much. We like promises that are being carried out." Jean de Dieu Ilunga, also a trade unionist: "You have to understand the situation. No one was coming in with fresh capital. We had to start afresh. ... The Chinese were looking to see what Congo needed. Our capital city was in shambles. Congo had been abandoned. We had to start from somewhere." His main concern was that Chinese workers are coming in on group visas and he fears that the companies are bringing more workers than they are allowed. "Yes, the Chinese all look alike but we are watching. We are against the group visas ... We want people to abide by the laws. It's true, they pay low wages, but we have collective bargaining. I want to insist on these points. We know what the situation is." Focusing intensely for a day on this case helped clarify a number of things (see the story on the conference at Africa/Asia Confidential). Tomorrow: a guest post on the Sicomines deal by one of the conference organizers. I think that the Sicomines Project will be good if both nations will help each other. The idea of investing in a copper mining and 2 $3 billion commodity-backed infrastructure credits is great. This will surely lead to the development of strong and harmonious relationship between the 2 countries. Comparing Chinese deals to other sectors is nice especially if the outcome is good. Being able to give nice benefits to native employees in order to retain them is better rather than hiring more foreign employees.